Crossing the land upon which the Abbey of Cerne Abbas had once stood, our party split into two groups. The more adventurous went to climb a hill. Having climbed it once before, on the hottest day in memory, and without hats or water, Stuart and I joined the more sedate party that skirts the bottom of the hill. We knew too that although the view across the Dorset hills was well worth the climb, the gentleman we had really come to see could only be viewed from a distance…or from the air. We had come to see the Cerne Abbas Giant… for us an old friend, but for the rest of our party, this would be their first encounter with the great figure carved into the chalk. Our secondary quest, though, was for a crop circle. 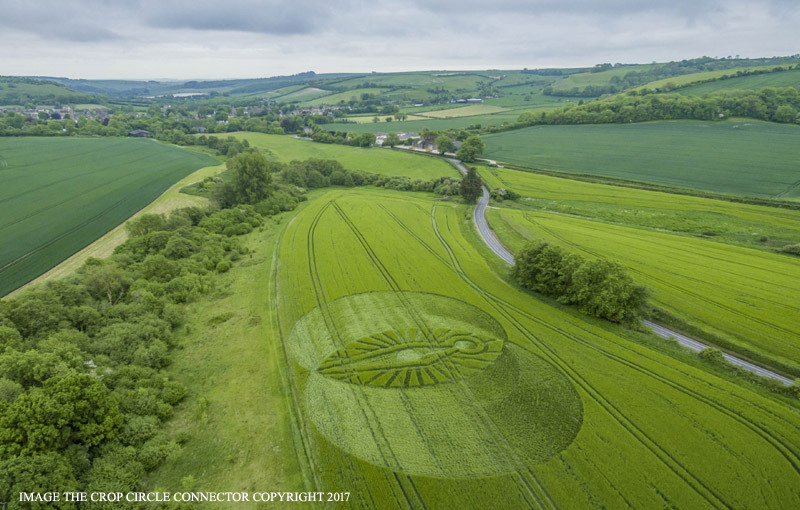 We had heard of one ‘in a field below the giant’ and there had already been one rather fortuitous crop circle in that area. We wondered some time ago if we should run a workshop in and around Cerne Abbas. Not only is it an area rich in archaeology and curious remains, there had been the ‘Glastonbury effect’. As we walked from the Silver Well to the church that first day, Stuart had been moved to blurt out that it ‘didn’t feel as if we were in England’. Later discussion revealed that this was the same, peculiar feeling he had experienced at a particular spot in Glastonbury and again at a little church in Nevern in Wales. Now, both of these spots are associated with large-scale sacred geometry in the landscape, on which much work has been done over the years, by eminent researchers and surveyors of both spiritual and scientific persuasions. Archaeoastronomy and sacred geometry in the landscape are, it must be said, not accepted by all, but having done our own research, we are convinced there is a basis of truth, even though the more extravagant claims may push the boundaries of believability sometimes. The thing with this kind of stuff is to keep an open mind. Science, as well as alternative archaeology, is continually widening our vista on the past. Many things that our ancestors were once considered too primitive to accomplish have now become accepted as mainstream fact. 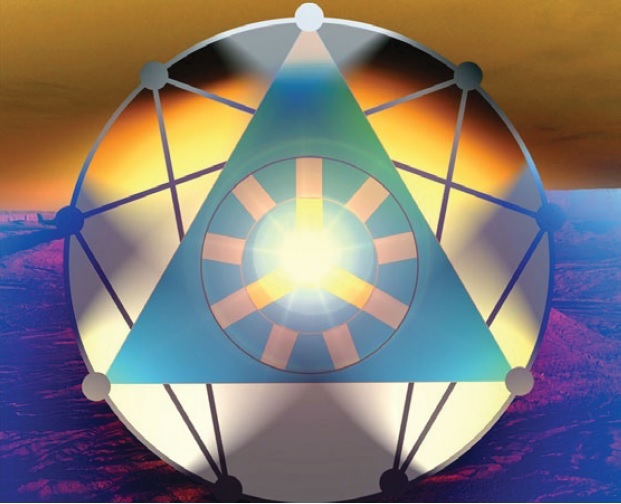 In both the locations where the ‘feeling’ had been apparent, it has been demonstrated that ancient sites mark out specific points on a figure called the vesica piscis, a geometric shape formed when two circles overlap in a particular way. What, we wondered, if there was a vesica at Cerne Abbas? We Googled. If there was one, someone would have found it, surely? It certainly looked that way, as the very first thing to come up was the image of a crop circle containing a vesica and the figure of the Mother goddess. And that one was in the field just below the very masculine giant… and had gone down just days before. Now, crop circles are another area wide open for debate. Personally, I don’t buy the ‘aliens’ theory, and some are quiet obviously commercial, jokes, or quite personal… but there are some curious anomalies with these complex and beautiful patterns. Is the land itself trying to speak through the makers of some of these designs? I do not know enough about them to judge… so I’m keeping an open mind. From ‘maybe’ to ‘we should run a workshop there’ was a very quick shift. Especially when we realised that, although no-one had reported finding a vesica, they had found a large-scale geometric figure, marked by sacred sites in the landscape… and so the two of us had dived down to Dorset on a research trip and the workshop had evolved from there. The most obvious ‘pattern in the landscape’ around Cerne Abbas, though, is the Giant… and he too demands an open mind. He stands a hundred and eighty feet tall on his hillside, within a six-sided enclosure whose outlines are still faintly visible. In one hand he holds a club, the other arm is outstretched and archaeologists have found traces of what may be a skin draped over it… and the possibility of a severed head in his hand. Some have compared the figure to that of Hercules with the lion-skin draped over his arm. Others see Orion… and the stellar alignments with that constellation are striking. He is a curious figure, with his own head being not only minimally sketched and sized, but invisible from most of the viewpoints close to hand. His virility, on the other hand, is not open to question. The giant is cut into the chalk of the hillside, gleaming white against the green. Above his shoulder, to the viewer’s right, is an Iron Age earthwork enclosure known as the Trendle, and there are burial barrows on the hill too dating from a similar period. These figures need regular ‘scouring’ to keep them bright and this would have been a task that the villagers performed together as a community. Couples too would come together at the obvious spot when they wished to conceive a child. The purpose of the giant, as well as its date of origin, is unknown. The most prosaic theory is that it was cut in the seventeenth century as a political joke aimed at the Puritan Parliamentarian, Oliver Cromwell. This is supported by a lack of documentary reference to the figure before that date. My favourite is the legend that the giant is the actual outline of a real giant who came from Denmark to invade the land at the head of an army, but who was beheaded by the villagers as he slept on the hill. The most prevalent belief is that he is an ancient figure, like the prehistoric White Horse at Uffington. As the grass grows over the chalk, the figures disappear… which might be one reason why no mention of the giant has been found before the seventeenth century. But then again, the earliest mention of the White Horse only dates to the twelfth century…and that has indisputably been there since prehistory! The most compelling indication of the giant’s antiquity though, must lie in the astronomical alignments with Orion. While we know that very many prehistoric monuments indicate the procession of the seasons, the movements of the stars and planets and were used to predict celestial events, I find it wholly unlikely that a political satrist would go to that much trouble for what must have been, by the very nature of politics, a transient joke. The Orion connection sure is intriguing. For what it’s worth, that connection came through in the meditation I had in the crop circle. Seeing the constellation in the book seems pretty convincing. I am finding it so interesting that all of these “figures” are appearing in my Y/A book series. Orion, as you will read once I get the darn thing published, comes up in book 1…then, of course, there is the giant in book 2…I certainly got a lot out of this visit and am looking forward to some time to process it. Oh goodness, I’m not sure I can wait now to find out… 😉 As for the book, I’m back to searching for a formatter to make it look nice. The one I hired (for cheap, you get what you pay for sometimes) did a really shoddy job. You did an excellent job with A Girl Named Truth. I am filled with wonder as I think on these things, first about the people who created the earthly things and then about the understanding of the stars and the figures and symbols they seem to portray. The universe is filled with endless mysteries and sometimes I think it will take many lifetimes to understand them all and incorporate them as a natural part of my spirit. My goodness! This has me filled to the top. History and thinking and questioning at it’s best. Thank you! Such a good read, and wonderful visuals as well. Sue with further detail about Cerne Abbas. I would say there is a definite connection between the giant and Orion, and cannot wait to know what happened at the crop circle! That crop circle was no random creation for sure. It is fully amazing. Thank you so much. I love all the photos too. Many of these crop circles are incredible works of art and geometry. can’t wait to read that post! This is fascinating. Such wonders to behold in this world. Absolutely fascinating, Sue. And I agree, we should keep an open mind about everything we don’t understand. Closing the mind makes you miss so much. This is so amazing, Sue, and I have never seen or heard about this giant. A fascinating post. When I read that the Gods once did the work of man before they decided to become Gods, it made me realize that we are the Gods, and the Gods R Us! Such a good thing to believe because when I look at the major works that have puzzled mankind for centuries, they had to be made by giants or Gods. How else could man conceive of such huge designs in the earth, and such things in perfection of design and meaning? Life gets more and more interesting by the post!!! Man looks to the vastness of the night sky and touches a shadow of eternity… perhaps these great works seek to share that moment of realisation.